You are here: Home / Ethnic Groups / The People of Maluku / Who are the Hitu? The Hitu live in five village areas along the North coast of Ambon island. These areas are in Central Maluku Regency, Maluku Province. In the past, the village of Hitu formed the commercial center and goods distribution point for Ambon island. Hitu can be reached by land or sea. Since the regional violence of 2000 and following, public transport only comes and goes once daily from the city of Ambon. The only historical record of the Hitu people is found in their stories, about how in the past they lived at the edge of the jungle. Later developments caused them to begin moving out of the jungle and building beach-side houses. 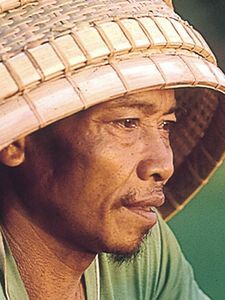 The Hitu people use the Hitu language, consisting of various dialects. The Hitu language is part of a larger linguistic group called the Seram Straits which also includes Laha, Paulohi, and Kamarian. The Hitu cultivate sago palm, coconut, and various spices. Their land, although fertile, remains sadly underutilized. Most of their land is governed by tribal law, and is regarded as tribal land. Most Hitu live near the sea in beach-side houses, but some live along the road leading to the city of Ambon. The Hitu area has plenty of fresh water, flowing from fissures in limestone rocks. These water sources form rivers flowing across the main road. Many Hitu combine both farming and fishing for income. In addition to the main crops, Hitu grow cassava, taro, cloves, and nutmeg. They also cultivate fruit, such as banana, durian and soursop. Some Hitu work as teachers or other government employees. Many Hitu women work as fish sellers. Hitu is the historical entry-point of Islam into the Maluku Islands. For this reason, nearly all Hitu people are Muslim. They believe that later they will be judged both on their knowledge of the Qur’an and on their good works. But like most Muslim people in Maluku, the Hitu are strongly influenced by even more ancient animism. Not all Hitu receive formal education. Even where schools exist, many finish only elementary school. In the whole Hitu area, there is only one agricultural school, one government Islamic school, and the private Islamic boarding school, Madrasah Tsanawiyah. Apart from needing formal education, the Hitu also need general knowledge about health and public sanitation. The Hitu society needs good leadership and direction to develop their physical health and their agricultural potential. Appropriate small-scale technology could also help them become a more productive society. They have very few chances to improve their job skills. Lack of electricity and dependable clean water supply also hinder development of Hitu society.